However you wish to examine it, Carolyn Bennett Sullivan has led a successful life. Following a nearly idyllic childhood in North Wilmington as the daughter of a minister, she attended college, studied psychology, and after graduation, embarked on what would become a 25-year career in medical sales. She is the mother of a 15-year-old daughter who attends a prestigious performing arts school in Wilmington. She has friends in all kinds of social circles, and she practices yoga, meditation, biking and enjoys great food. And yet, at every stop along that otherwise normal ascension, she has battled with what she refers to as "the monkey chatter in my mind." "Fear," according to Merriam-Webster's Collegiate Dictionary, tenth edition, is defined as "an unpleasant often strong emotion caused by anticipation or awareness of danger." The definition goes on to include several synonyms of the word that all appear as follows, in capital letters: DREAD. FRIGHT. ALARM. PANIC. TERROR. TREPIDATION. Fear, or nearly any derivative of the emotion, has served as Bennett Sullivan's constant companion throughout her entire life. It reached its high point five years ago, when an impending divorce threatened to swallow every last grain of her self-esteem, and a series of attempts to re-enter the medical sales field did not work out as planned. Then, in 2011, while she was attending a class about creating a vision for her life, she had an idea that would change her life. "I was sitting in class, and all of a sudden, the title of a book came to me," she said. "The idea kept tapping me on the shoulder, and I vowed that someday, I would get around to it. I kept talking about it with my business coach, and finally, he said, 'Carolyn. Write the book. Stop talking about it. I realized that procrastination, which is a form of fear, was preventing me from doing it. I was afraid of writing. I was afraid of how it would be perceived. Finally, I sat down, and the words just came." 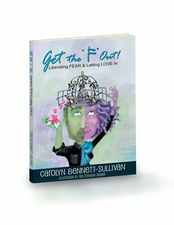 Self-published this past March, with illustrations by Ara Atkinson-Skinner, Bennett Sullivan's book, 'Get the "F" Out: Liberating Fear & Letting Love In," has in its four months already become a go-to book for readers who wish to help eliminate those same fears in their lives. The seven-chapter, 104-page book shares not only Carolyn's personal journey through fear but "real life" tools that be used to empower readers to release their fear and manifest a clearer sense of confidence. Throughout the book, Bennett Sullivan introduces the concept of what fear is all about; the many faces of fear; how to learn to detach from fear; and how to create opportunities from obstacles. She ends each chapter with positive quotes from spiritual leaders, authors and other public figures. "As I was writing the book, I kept thinking about what it was that I wanted to focus on," Bennett Sullivan said. "The book really began to take hold when I decided that I should write from the standpoint of my own journey -- about the common fears that have attempted to stop me from achieving happiness. "It was an exorcism in part, in a way to become very open to reveal the fears I had struggled with my entire life," she added. "It was an awakening, the realization that I'd been carrying this around me my entire life. Through writing, I was going through my own process of releasing these fears an stepping forward, and that by sharing it, maybe I could help others to do the same." Bennett Sullivan does not shy away from using her own life as a recurring "Exhibit A" through her book. She writes that the fears we experience throughout our lives -- whether they are merely nagging or whether they completely paralyze us -- come from our ego. "Our rational mind is often driven by our ego which tells us it doesn't make sense to follow your dreams, or you're not talented, experienced or have enough resources to pursue your passions," she writes. "I used to think that too until I realized how it kept me stuck in patterns of self-sabotage. "Fear which is driven by our ego is insidious in its control of our minds and thinking. It seeps in where we don't expect it and causes us to shrink away from our inherent connection, beauty and love." Rather than allowing fear to dominate the landscape of our lives, Bennett Sullivan recommends that we become a master over it. "The time has come for us to re-connect with our true selves, to embrace the power within, to know and trust the Divine spark that lives within every one of us and to live our lives based on possibility, purpose and passion," she writes. The response to 'Get the "F" Out" has been really positive so far, Bennett Sullivan said. "People have told me that they felt that I was writing directly about them, and many have referred to it as a constant resource for them," she said. "Although it is written from a woman's standpoint, what has surprised me is the feedback I've gotten from men. They've told me that it has really resonated with them." If her book serves as the first component of Bennett Sullivan's mission to spread her message, then her plans to create public speaking engagements and educational opportunities will serve as the other half. She conducts workshops entitled, "The 7 Faces of Fear," "What's Love Got to Do with It?" and "Free Your Fear," and has also recently published a reference guide to accompany the book. She is also developing on-line materials for those who will not be able to attend her workshops. If this year serves as a springboard to reach an audience of hundreds, then in the next five years, she said she hopes to reach thousands. Her message is all wrapped nicely within her mission statement: "Awaken you heart. Ignite your passion. Own your power." "Life is a journey, and you're constantly ebbing and flowing, and there's all kinds of growth," she said. "You never get there, because you're constantly on the journey. In the journey, do we learn how to become masters of our thoughts, or do we let the monkey chatter control us? "I've really let go of a lot of my fears. I've had to put myself out there, market the book and reveal my vulnerabilities, to tell my audience, 'This is who I am.' I've been able to let go of a lot of things I've had before." To learn more about Carolyn Bennett Sullivan and order "Get the 'F' Out," visit www.carolynbsullivan.com. The book is also available at Amazon.com.